Sharp-eyed Bob Baran spotted this old Red-tailed Hawk nest, high in the boughs of a silver maple, while stuck in traffic. See it? There, in the upper right corner of the photo. Well, Red-tails made the nest but someone bigger and far tougher has come along and appropriated it. Bob took a close look and spotted telltale ear tufts projecting above the nest. Great Horned Owl! Bob was good enough to let me know where the nest was, which turned out to only be 15 minutes or so from where I live in western Franklin County, Ohio. Look closely - she is staring daggers at your blogger, ears erect and visible on the nest's left side. BOTANY LESSON: Those little red globules are the flowers of the silver maple, our first tree to burst into bloom. But the owl gives not a whit of such stuff. They are strict carnivores with no interest in namby-pamby vegetarian stuff. Had the owls even suspected that I knew about and was interested in such matters as flowers, they probably would have set upon me and torn your narrator asunder. Some Great Horned Owls use large tree cavities created by broken-off branches or other such damage, but in these parts most use the stick nests created by raptors, especially Red-tailed Hawks. The hard-working legitimate nest owners can squeal and circle all they like, but it'll be for naught. Nothing rivals the Great Horned Owl for sheer ferocity in the bird world, at least in my neck of the woods, and they take what they want. Very early nesters, Great Horned Owls are sitting on eggs now, and should you espy a hawk's nest, pull out the binocs and have a gander. Perhaps you, too, will see the Tufts of Doom jutting from the twiggy jumble. Great Blue Heron rookeries are always worth a search, as the owls frequent comandeer one of the lanky-legged wader's abodes. As herons return early to their colonies, an uneasy truce sets in as the birds set up house-keeping while trying to ignore the killers in their midst. The male owl was perched in a gnarly tangle of branches, not far from where his mate warmed their eggs. These birds are legitimate bada**es - there is just no other way to put it. I've seen scores of Great Horned Owls over the years, and never fail to be struck by the absolute ferocity that they project. Those glaring yellow eyes pierce you with a withering stare that would be terrifying if one were potential prey. A bird with such prominent ear tufts could run the risk of appearing comical or clownlike, but in the case of the Great Horned Owl, they only add to the purposeful, slightly sinister look. This is NOT a silhouette that you want darkening your doorstep if you are a rabbit, skunk, or cat. Swift and silent, horned owls will give no warning of their approach. The leading edges of their flight feathers are fimbriate, or fringed, and thus muffle the sound of air passing by the wings. I, for one, am quite pleased that there are Great Horned Owls living nearby. They are common in the City of Columbus, and I sometimes hear a pair duetting from my window. The male's HOO's are deep and basso; hers are higher in pitch. Common as they may be, it isn't everyday that one gets to see a nest and I thank Bob for tipping me to this one. If time allows, I'll try and get back and check on them. We had an absolute humdinger of a thunderstorm blow through here last night, and hopefully the owls got through that with eggs intact. We could use some more Tigers of the Air around here. A freshly arrived Red-winged Blackbird stakes his turf from the stubby crown of a Sandbar Willow in western Franklin County, today. The floodgates of early bird arrivals really opened today. Warm southerly breezes ushered in temperatures pushing 60 degrees, and Turkey Vultures were riding the currents northward. Killdeers were loudly shrieking in every muddy field, and watery spots were filled with Canada Geese, Mallards and other fowl, and scores of migrant Ring-billed Gulls acted robinlike in the barren fields. To me, no bird speaks spring like the Red-winged Blackbird. When the stunning males take up their posts and burble out their sputtery Konk-ah-ree-Onks, we've turned the corner and winter will soon be a distant memory. Where there were none of these last week, today, they are everywhere. As a little kid, I was astonished that such an incredible bird could exist. While still in the single digits of age, no one was telling me that Red-wings were "trash birds", or so common as to not be noteworthy. Each spring, a few gaudy males would visit our backyard feeding stations and strut their stuff. And even though armed with only a bicycle, I didn't have to pedal far from home to find territorial blackbirds conspicuously posting their territorial borders. I thought they were of the utmost coolness. And still do. Watch a male on territory, such as the one in these photos. He'll sit there for a minute, watching for other males that are bold or stupid enough to enter his domain. Then, in a spectacular show, the bird will inhale, visible puff up, fan his tail and splay those magnificent wings forward like a bodybuilder doing a most-muscular pose. Those scarlet-red shoulder epaulets, trimmed in gold, just explode into flames of color in a scene that's nearly unrivaled amongst our songbirds. In a week or so, the much more muted female Red-wings will arrive and the males will turn the charm knob up to 10. Wait'll you see one of 'em strutting around one of the hens, throwing out those shoulders and Konk-a-reeing with all his might. It's quite the spectacle. If Red-winged Blackbirds were rare as Painted Buntings in Cleveland, we'd all go crazy over this bird. Come spring, and a boy's thoughts turn to frogs. At least mine do. Here in Ohio, we're still locked in winter's last gasps. It snowed a fair bit yesterday, and temperatures are projected to plummet to 19 degrees tonight in Columbus. But at this time of year, it's as if Mother Nature is shaking out a huge blanket, trying to cast off those last bits of sleety snowy nastiness and clean the sheet for spring. March becomes a roller coaster ride of meteorological ups and downs, yo-yoing between winter/spring, winter/spring. Come Monday, it's supposed to hit near 60, but then plunge to much cooler temps again for a few days. But the froggy set doesn't need much encouragement to float to the top of pools and ponds and start to do their thing. In fact, there have already been numerous reports of Spring Peepers piping up on the few warm days we've had thus far. 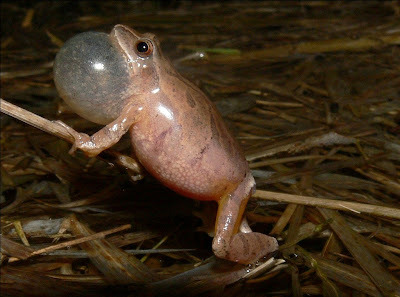 Within the next week or so, the outrageously loud vocalizations of Spring Peepers will resonate from wet spots throughout much of Ohio. These tiny blowhards are incredibly, nearly unbelievably, noisy. Many is the time I have stood in the midst of an ephemeral pool fueled by spring rains with legions of peepers peeping all about. Their calls are so loud and of such pitch as to be nearly painful. Males, such as the one above in full tune, must either be deaf at certain frequencies or possess a shutoff valve that clamps over their hearing organs when in song. A tip for observing these suction-footed little charmers. If you detect a pool full of peepers, wade on in. All the frogs will instantly shut off upon your approach, as if waved to silence by some amphibious symphony conductor's baton. Stand still and patient, and within a few minutes the peepers will begin popping to the surface all around you, and resume their singing. It's a rather magical experience and the way to experience firsthand the full brunt of their wall of sound. A common companion of Spring Peepers is this tri-striped little beauty, the Western Chorus Frog. It is sometimes called the Striped Chorus Frog and I think that I prefer that moniker. This one was photographed on a warm rainy night in early March of last year, in Logan County, Ohio. Their song is quite easy to learn and one that I'm sure you've heard if you live in the eastern half of North America. A Western Chorus Frog sounds like someone running their fingernail down the teeth of a comb, but piped through a stack of Marshall amps. The colder it is, the slower the frog runs through its scale. Their coarse raspy trills offer an interesting musical punctuation to the high-pitched birdlike notes of the peepers. This is it - the world's toughest frog. No amphibian ranges further north than does the Wood Frog, and I'm sure that they've already been into breeding pools at least in southern Ohio. Wood Frogs literally have "anti-freeze" pumping through their system. The frog uses urea and glucose to create so-called cryoprotectants that allow it to re-thaw itself after being frozen nearly stiff. Wood Frogs are wonderful ambassadors for vernal pools in this part of the world. Small wooded pools that flood with early spring rains are where most of our Wood Frogs go to breed, and seeing a pack of them going ape in a small vernal pool is truly a sight. From afar, the male's collective singing sounds like the quacks of a distant flock of Mallards. If you'd like to learn more about vernal pools and all of the fascination that they offer, the Ohio Environmental Council is offering a couple of educational workshops. DETAILS ARE HERE. The OEC also has produced a fabulous new Guide to Vernal Pools, and I'm sure they'll have it available at the workshops, or you can score it through their website. 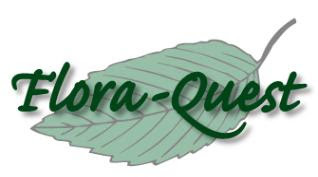 For the fifth year running, the event known as Flora-Quest is back and better than ever. 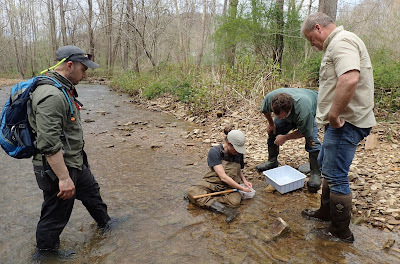 Held in the heart of the vast woodlands of Ohio's Shawnee State Forest, this is hands-down one of the most rewarding immersions into natural history that one could ask for. "F-Q" takes place over the weekend of April 29 to May 1 - a time when Shawnee is lush with growth, full of birds, and lots of other interesting fauna. If you've not been to Ohio or have spent little time here, and love natural history, I really encourage you to consider attending F-Q. There are very few places in the eastern U.S. that can rival Shawnee State Forest and vicinity in terms of sheer plant diversity, rare species, great honking globs of butterflies, and over 100 breeding bird species, most in big numbers. The event is organized to the nth degree and run flawlessly, and it's not like you'll be stuffed in some drafty tent - unless you want to be. Base camp is the wonderful lodge at Shawnee State Park, which is as nice as about any hotel, with a restaurant, and bar! Plus, there'll be Luna moths stuck to the side of the building when you emerge in the morning, and you'll be able to hear Cerulean Warblers singing from your room. Plants are the focus of Flora-Quest; Exhibit A above. There are ten "Quests", each led by a pair of extremely knowledgeable botanists/naturalists who know the region like the back of their hand. The group above is clambering around an old, remote cemetery that is carpeted with Indian-paintbrush, Castilleja coccinea, in spring. Each Quest has a subfocus, such as birds, aquatic life, geology, etc. Come on mine, for instance, and I will guarantee you will see MANY birds. Thus, Flora-Quest is really a fabulous hands-on workshop in ecology, taught by people who really know their stuff and are good at conveying that knowledge to others. After the field trips are over at day's end, it's either party central at the lodge or we can head out and look for Whip-poor-wills, scads of cool amphibians such as Mountain Chorus Frogs, and possibly even a Bobcat or Bigfoot. Since Year One, there has been a mascot plant for every F-Q, and I'll share those as each is telling in regards to the sensational diversity of flora in and around Shawnee. This one is the threatened Wherry's Catchfly, Silene caroliniana ssp. wherryi. It grows on barren shaley slopes under oaks, and the profusion of brilliant pink blooms on an otherwise stark forest floor makes one rub one's eyes and blink, so striking is the effect. 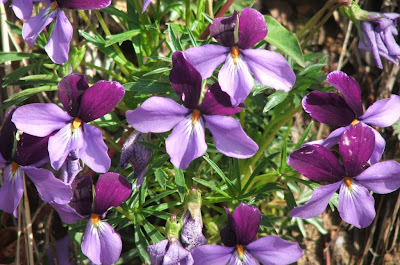 Our largest and showiest violet is this, the Birdfoot Violet, Viola pedata. It liberally festoons dry rocky banks, and we'll see lots of the stuff. It is one of the violets that feeds the caterpillars of the striking Great Spangled Fritillary butterfly, which occurs in such profusion in Shawnee that it can be mind-numbing. Everyone loves an orchid, and we'll see some cool ones. This is Large Yellow Lady's-slipper, Cypripedium parviflorum var. pubescens. An impossibly good looking plant, it often inspires otherwise normal people to prostrate themselves to better admire its charms. Large bumblebees - quite fuzzy! - provide pollination services. An arguably cooler orchid yet is the Pink Lady's-slipper, Cypripedium acaule. 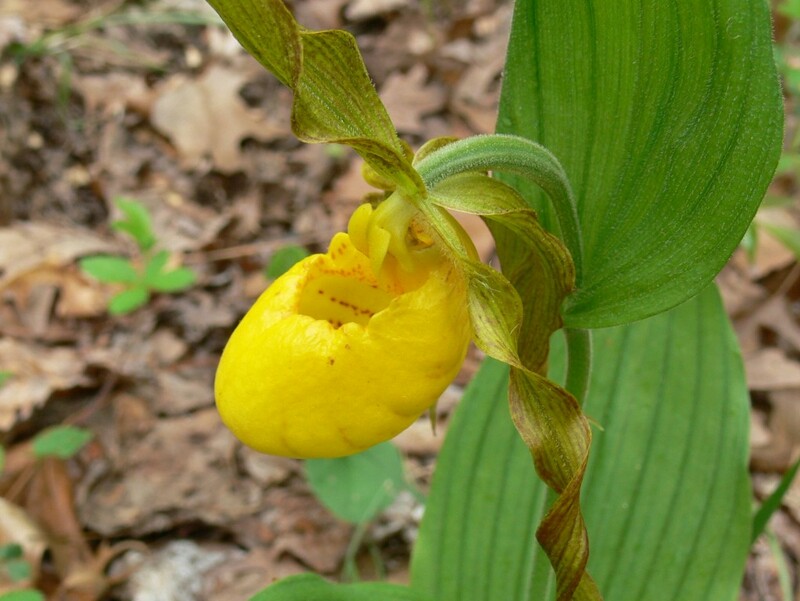 We know of spots where this and the yellow slipper grow nearly hand in hand. There are colonies of the pink that number into the dozens. This species, to me, has an almost surreal alien quality, bursting as it does from from an otherwise flowerless carpet of oak leaf litter. Had I nothing better to do, I could plop down in a patch of these pink slippers and stare at them for quite some time - and sometimes do, anyway. And this year's Flora-Quest official plant is the utterly smashing Dwarf Iris, Iris verna. It's our smallest and rarest iris - listed as threatened in Ohio - and the only one that grows high and dry on upland ridges. Shawnee State Forest is really the only good place to see it in Ohio, and if you come, see it you will. 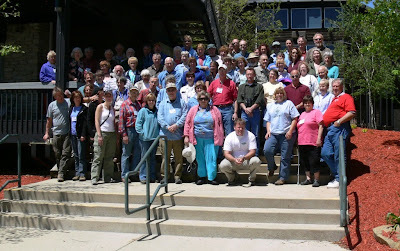 Here's part of the group from a few years ago. A good time was had by all, and I guarantee everyone upped their botanical IQ by at least a few points. If you want to start spring with a bang, sign on to Flora-Quest soon. Spaces are limited, to keep field trips down to a level that ensures great leader to participant ratios, so check in soon. All of the details are RIGHT HERE. Hope to see you there! 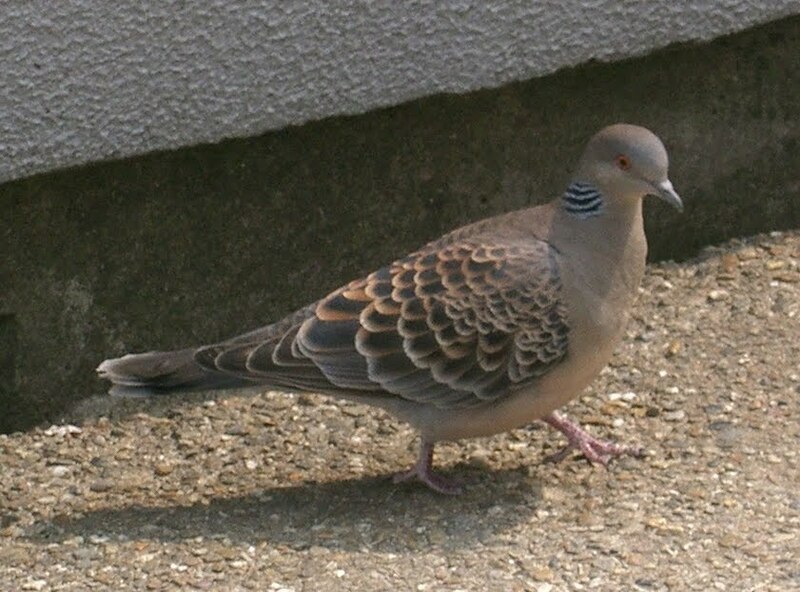 Well, it seems an Oriental Turtle-Dove has appeared in the gardens of a gentleman in the United Kingdom, causing quite a stir. Hundreds of twitchers - that'd be "listers", stateside - have flocked to the scene to see the admittedly cool-looking dove. This is apparently only the 2nd United Kingdom record, at least of this subspecies, and birders are going bonkers. The owner of the property where the dove appeared has a definite entrepreneurial bent and is charging birders five pounds apiece - a pound is about equivalent to $1.60 US. Bully for him, and he's giving the entire pot to charity. Read the article and see a rather amazing photo of the line of dove-seekers RIGHT HERE, courtesy of The Sun. Last post from Florida - promise. But with weather here in Ohio cold, rainy/sleety, and dipping down in to the low 30's, it's time to regurgitate a few more photos from the Deep South, these of a most interesting animal. A familiar silhouette in the Florida swamps - a long-tailed, long-necked, long-billed Anhinga. Sleek and ebony, a male Anhinga fans his wings dry after a fishing trip. Like the closely related cormorants, Anhingas lack waterproofing oils and thus are not very bouyant. This necessitates lengthy timeouts to dry the plumage, but decreased bouyancy is an asset if you wish to stay under water, pursuing piscine prey. A female Anhinga, brown about the head and neck. It looks like she has donned a wool pullover. 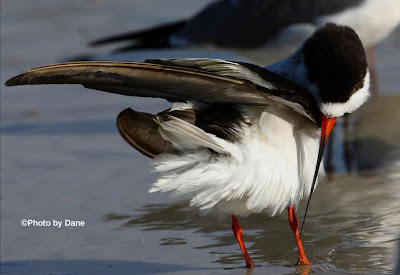 Say, if you struggle with learning scientific names, and have always been dazzled by those propellerheaded techno-geeks that can spout them at the drop of a hat, this bird can be your entree to that rarified crowd. Anhinga. Scientific name: Anhinga anhinga. Or you could dispense with Anhinga altogether. This bird has several other cool names. Darter. Snakebird. And a personal fave, the Water-turkey. But Anhinga is a pretty cool name, with interesting roots. It hails from tribal Brazilian lingo and roughly means "devil bird". They'd know the bird well down there, too - like so many of Florida's southern specialty birds, the Anhinga reaches its northern limits in the southernmost U.S. but ranges widely throughout South America. A male Anhinga belches out what, quite frankly, is a pretty unmelodic tune. Basically, they make surprisingly loud nasal croaks - not a sound you'll probably hear on those soothing sounds of nature CD's. At one spot, I was able to watch an Anhinga swimming underwater. As ungainly as they may look when flopped onto a branch, wings outstretched like an oafish Dracula spreading his cape, they transform when in the water. The photo above shows how Anhingas acquired the "snakebird" nickname. With only head and neck protruding, and the shadow of that long skinny body following behind, they do resemble a serpent slicing through the water. The business end of an Anhinga; not something you want to encounter if you are a fish. Anhingas are astonishingly fast and graceful when submerged, and more than capable of overtaking prey and spearing them in the blink of an eye with that daggerlike bill. We saw one that had impaled a fair-sized bluegill so firmly that the bird was forced to beat and swipe the fish against a stout branch in an attempt to dislodge it. After ten minutes or so of watching that struggle, I left and the Anhinga was still flailing away. Anhingas are excellent flyers, and can soar high aloft every bit as effortlessly as eagles. Sometimes they'll catch thermals and swirl skyward until they're just tiny specks. Every now and again, an especially exploratory Anhinga will venture way to the north of where they ought to be. One was seen in Ohio way back in 1885, along the Ohio River near Marietta. That stood as a remarkable record for over a century, until Judy Semroc photographed another Anhinga near Akron in 2006. And I don't think we've seen the last of these odd water-turkeys. Today and yesterday offered up a major dose of the impending spring. Warm and windy, with highs in the low 60's. I just returned from a 75 mile ride on my Ducati - not something I often get to do the day before my normally wintery birthday. Turkey Vultures are funneling in, and I heard several Horned Larks passing overhead the past two days. Birders have been reporting displaying American Woodcock, and there are lots of waterfowl pushing north, close on the heels of ice-out. And it won't be long at all until green things push from the soil! Following is a reminder of what our very near future holds in store. Hepatica, Hepatica nobilis, photographed on March 8th, 2009, Adams County, Ohio. Bloodroot, Sanguinaria canadensis, April 4th, 2010, Greene County, Ohio. Wood Poppy, Stylophorum diphyllum, April 11, 2010, Adams County, Ohio. Goldenstar, Erythronium rostratum, April 5, 2008, Scioto County, Ohio. 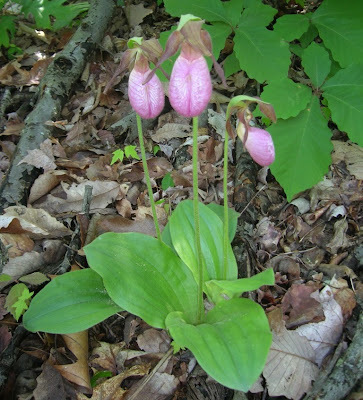 Some of us have a botanical foray planned for April 2 in southernmost Ohio, and by then, we should be able to find blooming specimens of all of the above. I REALLY look forward to that. 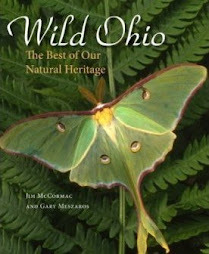 Sorry, a bit of a last minute reminder here, but the annual Ohio Natural History Conference is this Saturday. As last year, it'll be held at Big Walnut High School in Sunbury, just north of Columbus. The keynote speaker is the one and only Dr. Evan Blumer, past director of the Wilds, a place I have written about many times, such as HERE. Evan's talk should be worth the price of admission alone. 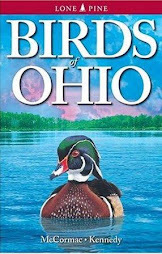 This is the 7th year for this conference, which features a wide variety of talks on various aspects of Ohio's diverse flora and fauna. 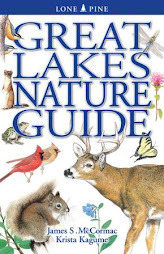 All of the details can be seen HERE, and they'll take walk-ins, so if you are in the area and want to learn more of our natural world and meet other like-minded people, stop in. The conference is organized by the Ohio Biological Survey, and if you've got any questions or want other info, visit HERE. When I was in Florida recently, I apparently missed fellow Ohioan Dane Adams by a short leap and a bound. He and his wife were in the same area, around the same time, and of course Dane was making some of his trademark awesome photographs. Those of you who read this blog regularly will recall some of Dane's beautiful images that he has allowed me to share. Well, wait'll you get a load of the one that follows. 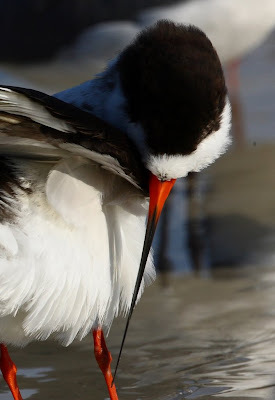 This picture, of a chunky Black Skimmer, is mine. I took it near Sanibel Island as the odd-looking bird rested with a platoon of other skimmers. I would say that the first thing about a skimmer that grab's one eye is that bill. It's fat, asymmetrical, and bright orange at the base. Being nearly as thick as the bird's head, one might think that this appendage would be an awkward forward-heavy thing to have stuck to the front of one's face. Here's Dane's photo. Wow! Look at the razor thinness of that beak! It seems as if the bill tapers to nary more than the thickness of a sheet of paper near its tip. Scroll back up the first photo and blink at the contrast. Skimmers hunt by flying just over the water's surface, slicing the lower mandible of their incredible bill through the upper strata of the water column. I have photos of that, and discussed their feeding in more detail, HERE. As we can see from Dane's photo, the lower mandible of a Black Skimmer would offer little in the way of resistance; it is incredibly hydrodynamic. Not only does its thinness produce no drag, its shape also creates nearly no turbulence, which might alert potential fishy victims that something very bad for them rapidly approaches. Thanks to Dane Adams for sharing his spectacular photo. Looking like a giant bonsai, an old Scots Pine, Pinus sylvestris, is a prominent landmark at Green Lawn Cemetery on the south side of Columbus, Ohio. I stopped in last Sunday, and couldn't resist making some photos of this gorgeous specimen. It's by the bridge, and I'll bet three bucks that at least a few of you have seen it, and paused a minute to take in the tree's complexities. Another shapely Scots Pine that is often noticed and commented on is along the northernmost road at Killdeer Plains Wildlife Area. Someone long ago erected an identifying marker, which is a good thing as the tree is so striking that many observers wish to know what it is. One minor quibble: trees, I believe, like birds, should have but one formal common name. And for this pine, it should be Scots Pine. But the moniker is often put forth as Scotch Pine, but not in most serious botany books. The sign-maker hit the scientific name on the head, though: Pinus sylvestris. And it's this genus - the true pines - that make American botany professors and science teachers blush and mumble, and their juvenile charges chuckle and joke. Pinus = Pee-nus. Dangerously close in pronunciation to that of an appendage best not mentioned in polite company. So we have Pee-nus sil-ves-tris. C'mon, class, repeat after me. If you've got a bunch of high schoolers or even some juvenile frat boys in the biology class, they'll be suppressing snorts and thinking of jokes. Heck, I still do. Anyway, this species, no matter what you call it, is a hand's-down favorite of mine. When of the right stock and grown in open conditions, Scots Pine becomes a work of art. The branches are gnarled and contorted, creating complexities that draw in the eye and hold it. It's not just the alluring form of a well-grown Scots Pine that is so cool - the bark is typically strongly orange-tinted, flaky and papery. The overall effect is nearly magical. Small wonder that this pine, which is indigenous to Europe and Eurasia and ranges broadly across that region, is said to now be the world's most widely distributed pine. People want such a plant, and have transported the Scots Pine far and wide. The cones are on the smallish side, with thick wedge-shaped scales terminated with a slightly prickly umbo, or projection. "Umbo", now there's a word for you. I almost named a cat that once. Needles are in pairs, and often take on a slightly glaucous, or bluish-green, tint. If you find yourself at Green Lawn Cemetery, take a moment to stop by and admire this magnificent Scots Pine. A boggy spring, only minutes from my hutch. Visiting this gooey mire is a major spring ritual for me, and today was the day. Just as the famous groundhog Puxatawney Phil (or whatever his name is) is watched closely in a rather foolish shadow-watching ritual, I visit this spring in late winter to witness the botanical counterpart to the wedge-headed Pennsylvanian squirrel. Yes, my peeps! Although it is only February 13, I declare Spring is Sprung! Out they were, our first true native wildflower to poke forth, the vegetable version of the groundhog. Skunk-cabbage! Good ole Symplocarpos foetidus is thermogenic, meaning it produces heat. This gives it the ability to deal with low temperatures and persistent ice and snow. I've written about this oddball plant's mechanics in past posts, should you be interested. Proof is in the pudding, or spathe in this case. Here, we peek through the doorway in this Skunk-cabbage's thick leathery and liver-spotted spathes, to the spadix. Those little sugar granule-looking things peppering the spadix are the skunker's flowers - the very first to be found in spring amongst our native plants. Take heart, plant-seekers. The appearance of Skunk-cabbage truly heralds the opening of spring's floodgates, and it won't be long before lots of other greenery shoots forth. That Skunk-cabbage spring drains into this, the mighty Scioto River, arguably the greatest stream within the State of Ohio. There are almost always ice-free sections and I went streamside to have a look. It was a trip well worthwhile. A good smattering of ducks bobbed in the icy waters, including this flotilla of Common Goldeneyes. If the Skunk-cabbage is the plant world's harbinger of spring, and that groundhog the mammal kingdom's, the goldeneye is the bird world's sign of earliest spring. Not because goldeneyes emerge from the mud about this time after a long winter's hibernation, or are now just returning from some Caribbean vacation - they're tough as nails and overwinter in Ohio wherever open water can be found. A chocolate-hooded female goldeneye follows a discreet distance behind a showy male. Goldeneyes herald spring because now is when they enter, hot and heavy, their truly insane courtship antics. This pack of studs was going at it full throttle today, and I spent quite some time watching and perhaps picking up pointers. These boys really pull out all of the stops to woo the girls. Like desperate lounge lizards in a watery fern bar, the male goldeneyes throw their necks back and bill skyward, and emit comical nasal buzzes. Then, in a spectacular display of aquatic break-dancing, a displaying drake kicks his brilliant orange feet forward and out of the water. While the males in courrtship mode emit buzzy calls that sound like a nighthawk being strangled, they sound really cool in flight. Their wings produce a loud clear whistling, hence the colloquial name "whistler". If you want to read more about goldeneyes, I wrote a piece on them HERE. I hope that these positive reports on the signs of spring give you hope, fellow Tundra-people. Major Randel Rogers, Ohio Army National Guard, sends along news of an interesting report. Some of his men discovered a gang of Short-eared Owls sitting around on a bunch of National Guard jeep hummers. Why these owls would choose heavily armored military vehicles as a roosting spot is open to speculation, but I have my theory. Thanks to Major Rogers, and J. Valentine and T. Friend for bringing the owls to our attention and snapping the following photos. The owl spot is along James Road on the east side of Columbus – a stone’s throw from the vast and vole-filled fields of Port Columbus International Airport. Click the pic and look closely – at least four Short-eared Owls can be seen sitting around on the hoods of the Hummers. And there were several others. Trust me – none of these photos are faked; these owls really are roosting on Army Hummers in a heavily urbanized part of Columbus. Again, this odd behavior shouts out for answers. A closer view of one of the savage-looking and exceptionally clever beasts. So why are the owls adorning military Hummers? Because of these. Meadow Voles. The nearby open grassy expanses of the airport undoubtedly support scads of the little rodents, which are a favored prey item of Short-eared Owls. But this still doesn’t explain the owls’ highly unusual selection of roosting in a military depot filled with heavily armored war craft. Our little furry brothers, the Meadow Voles, have been oppressed for thousands of years. And owls are The Great Oppressors. Think about it. You’re a guy – albeit a guy with four legs, furry, with stubby ears – who really doesn’t bother anyone, just tunnels about the meadow grazing on succulent plant matter. But every time you or anyone in your community pops above ground, death lurks in the form of large shadowy owls patrolling overhead. An eon of living with that threat would cause any class of oppressed animals to throw off their shackles, rise up, and attempt to cast out their tormentors. The airport voles have become the rodent world’s Egyptians and the Short-eared Owls are the avian Hosni Mubaraks. I believe these voles have begun The Fight to end their persecution. Voles aren’t dumb. By gathering a volatile mix of airport de-icing chemicals, decaying roots of fescue grasses, common road salt and their own dung, and fermenting the whole mess inside discarded sandwich baggies that litter the grounds, they’d have a highly potent explosive. By harvesting strongly flexible shoots of the numerous sandbar willows (Salix interior) that grow in the airport’s low swales, vole warriors could easily craft powerful catapults that could be used to launch Surface to Air Missiles (SAMS) packaged tightly in the sandwich baggies. I suspect that a Vole Liberation Army (VLA) has developed technology that allows them to blast Short-eared Owls from the skies with their willow-fired SAMS. These guys send a few owls hurtling to the ground like flaming Roman Candles, and word’s going to spread quickly amongst the short-ears that a new Sheriff is in town. But owls are no dummies, either, and are further advanced along the evolutionary scale than their now arch-enemies the voles. And if you think that these feathered Attila the Huns are going to run from a battle, you’ve got another thing coming. The owls’ problem is now a technological one. The Old Ways of conquering and holding the voles in the shackles of oppression no longer work. Merely plucking the tiny beasts from the grasses with their admittedly formidable talons is now an exercise in extreme peril. Send a few owls crashing to earth in a blazing heap via vole-fired highly explosive SAMS, and it’s time for a New Way. Enter the National Guard. 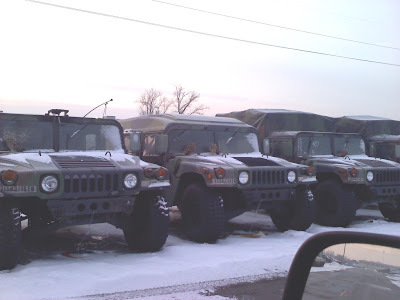 Brilliant and opportunistic, the owls would have long ago noticed the nearby depot with its fleet of highly armored and heavily armed Hummers. Probably, had the voles not upped the technological ante, the owls would have never tapped this resource. My hunch is that the short-ears are now hunting the voles under cover of darkness in these wheeled death-dealers. The voles’ SAMS would be impotent against such armored cars, merely exploding harmlessly against the Hummers’ flanks while the owls laugh and sneer from within. Equipped with their new military hardware, the owls now have a wide range of armaments with which to deal with the voles: flamethrowers, heavy machine guns, incendiary bombs, light nuclear warheads, and powerful wrist-rocket slingshots, all wrapped up in a highly mobile SAM-proof wheeled vehicle. Score: Voles – 1. Owls – 2. I’d recommend that the Guard keep close tabs on their Hummers. An adult Little Blue Heron stalks prey in the open waters of a Florida marsh. This is rather extroverted behavior; Little Blues often are inconspicuous, hunting from the shady verges of wetlands and waterways. On my recent trip to the Sunshine State, I logged eleven species in the Ardeidae, or heron family, and most of them in good numbers. Many of these lanky-legged, dagger-billed, plume-bearing beasts are among the most conspicuous of Florida birds. Even the most casual observer of nature notices them. Not so much the Little Blue Heron. The name "Little Blue Heron" somewhat diminishes the true pizazz of this beautiful species. It suggests subservience to the - in the U.S. - much more widespread and commonly seen Great Blue Heron. The two are different as night and day. Little Blue Herons are in the genus Egretta, which includes some of the world's truly gorgeous small herons. In the United States, discounting three species of major rarities that have strayed to our shores, the Egretta ranks include Snowy Egret, Tricolored Heron, Reddish Egret, and the subject of this post. Of these four herons, I would say that the Little Blue is rather overshadowed by its more extroverted brethren. Snowy Egrets, with their electric white plumage replete with billowy plumes and golden slippers for feet, can't be missed. Tricolored Heron and Reddish Egret are the gonzo madmen of the heron world, often dashing about maniacally and tenting the waters with outspread wings to lure fish to the shade and their death. The Little Blue Heron is typically reserved and methodical, slowly stalking quiet waters in search of minnows, crayfish, frogs or nearly anything else that is small and moves. Adults are stunning upon close inspection: the body is of a uniform rich slaty-blue that contrasts with a lustrous purple neck and head. The swordlike bill is powdery chalk at the base, but is dark-tipped as if the bird had gone fishing in a can of black paint. First-year Little Blues look utterly different. They're white, and easily confused with other species of white herons and often are. At a place known as Shark Valley in the Everglades, I had the good fortune to make the acquaintance of an unusually trusting Little Blue Heron. At this place, there is a 15-mile loop trail, and it's heavily used by touristos. As a result, many birds have become quite indoctrinated to optics and camera-toting bipeds and will allow exceptionally close approach. I spent much time with the fellow above, observing his behavior and actions at near fingertip range. The heron cared not a whit and would not take his eyes off the water, even when he would practically walk over my feet. He was on the hunt, you see, and a hunting Little Blue Heron is a study in absolute, impeccable concentration. At such close range, I could see that the heron's eyes are set in its skull to look forward, not straight out to the side. It's as if the bird is sighted in to look directly down the barrel of a rifle, and that powerful bill is the gun. For some reason, its eyes reminded me of those of a cat: round, inquisitive and all-seeing. The Little Blue would ever so gently stalk the margins of this canal, slowly lifting and placing its size EEE feet like a boy trying to walk through a leaf-littered forest without making sound. Never did it divert those magnificent eyes from the task at hand, constantly bobbing, craning and tilting for new perspectives. When prey was locked in on, POW! Forget about it. With an explosive uncoiling of that strong springlike neck, the heron would thrust its bill forward in a split second like an archer releasing an arrow. Whatever was the object of its desire probably never knew what hit it, its fate soon to be expulsion as guano after the heron's system extracted the good stuff.